In my last post I shared the Popcorn Bar we had at the birthday party I recently hosted. 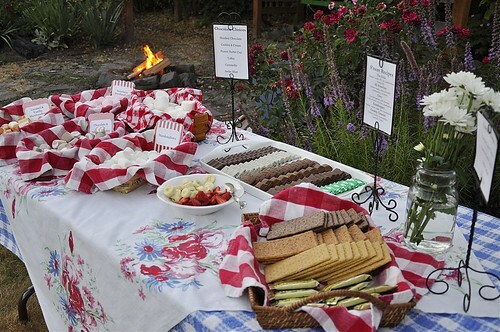 Well, before they watched the movie in the backyard the kids wanted to have a fire and make s’mores so I put together a s’mores bar for the party too. Yikes – two bars at a party for high school kids!! Ha, ha!! The s’mores bar consisted of five different kinds of marshmallows. We had regular marshmallows in both regular size and JUMBO. There were strawberry marshmallows as well as chocolate and vanilla marshmallows and caramel and vanilla marshmallows. I found them all at my local Winco grocery store. In addition to a selection of marshmallows we had a selection of crackers too. 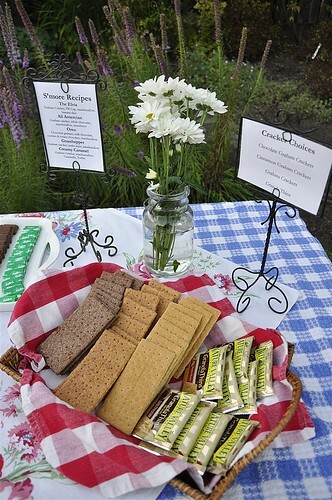 There were regular graham crackers as well as chocolate and cinnamon ones. 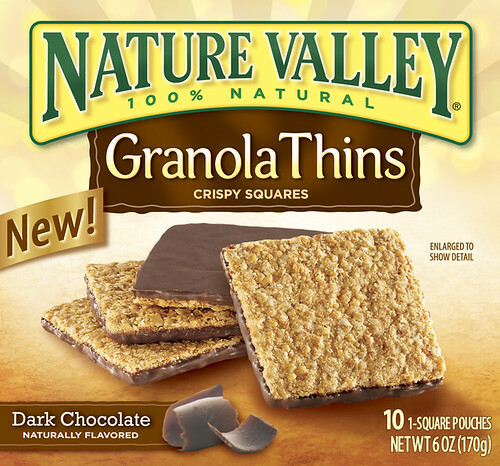 A while ago Nature’s Valley sent me a box of their new Granola Thins to try out. I love Nature Valley granola bars so I was excited to try this new version out. They are a thin granola bar with a layer of either dark chocolate or peanut butter on one side. They are delicious straight out of the package but I knew they would make a perfect s’more so I literally had to hide them in the back of the cupboard to keep my family from eating them all. Well I was right – they make a great s’more. 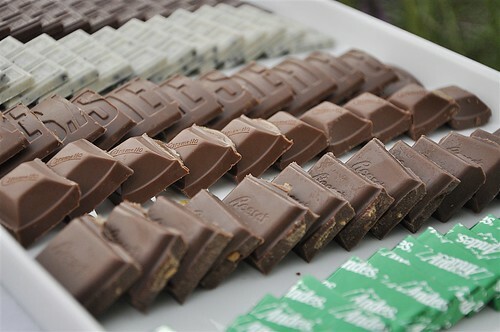 In addition to a selection of marshmallows and crackers we also had a selection of chocolate. Of course there were regular chocolate bars but we also had cookies & cream, Symphony bars, Reese Peanut Butter bars, Caramello and Andes Mint. Choose your chocolate! There was even some fruit to use in your s’more – bananas or strawberries. I also found some fun s’mores recipes on a blog (which I can no longer find so no link, sorry!) but I typed up some of them to give the kids some suggestions on combinations they could make. 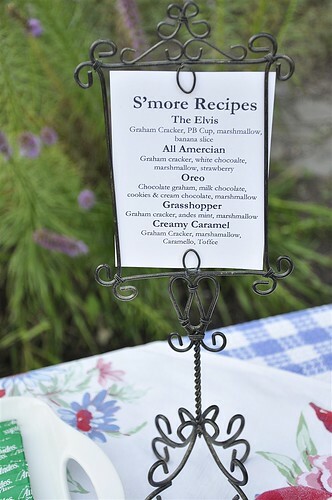 How about an Elvis Presley s’more! And of course the last ingredient to a s’more bar is a fire! This one needs to burn down a bit before it’s ready for s’mores though! 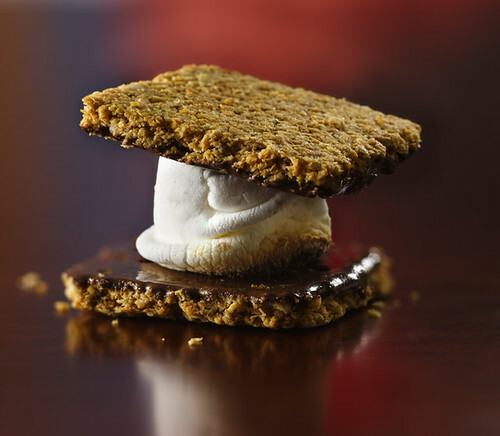 What would your favorite s’mores combo be??? Wow, you really know how to have a party! Everything is so organized and cute! I seriously need to learn from you about hosting parties. I’m not very good at any of that stuff but I hope to someday have fun parties for my kids and for other get togethers. And I have never heard of those flavored marshmallows! It really makes me want to have a s’mores bar of my own! WOW! I am completely inspired by your fabulous idea and display. I didn’t know they made a Reeses’ Peanut Butter bar! I must look for that this weekend and make some fun s’mores. Thanks! OMGoodness… this S’mores bar is the cutest thing ever!!! I think I will have to have a party soon just so I can do this! LOVE IT!!! Seriously you are the best mom ever!! Can I come live with you?? Absolutely – move on it as long as you help me get my house organized!!! 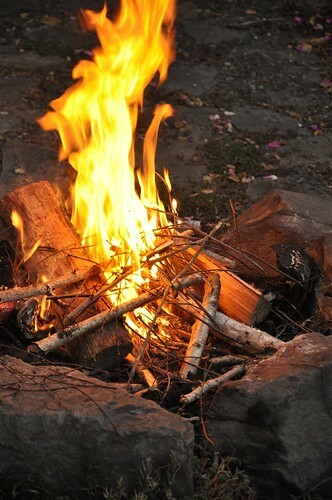 Okay, I am building a fire TONIGHT and making a reeses peanut butter cup smore. That sounds amazing. Thanks for all the good ideas. Also, I was wondering where you found your metal stand that holds the smore menu ideas. Do you remember where you found it? Tauna, I lucked out and found them at Goodwill for $1.99! Leigh Anne, what won’t you come up with next?! You share some of the best ideas! Very creative……thanks for posting! Wow! Who would of thought to have all those options- well, besides you of course. We aren’t smores eaters around here (except me during my last pregnancy). My choice would really have to be thought out. I would probably stand there forever trying to decide. The Nature valley granola thins look perfect to me with the dark chocolate and a simple original marshmallow. I want to know what the favorite and least favorites were among the kids. I love smores and I had no idea there were so many different flavors of marshmallows. I will be heading to Winco to buy some for myself. They sound soooo good! This is a great idea. Thank you so much for posting this. 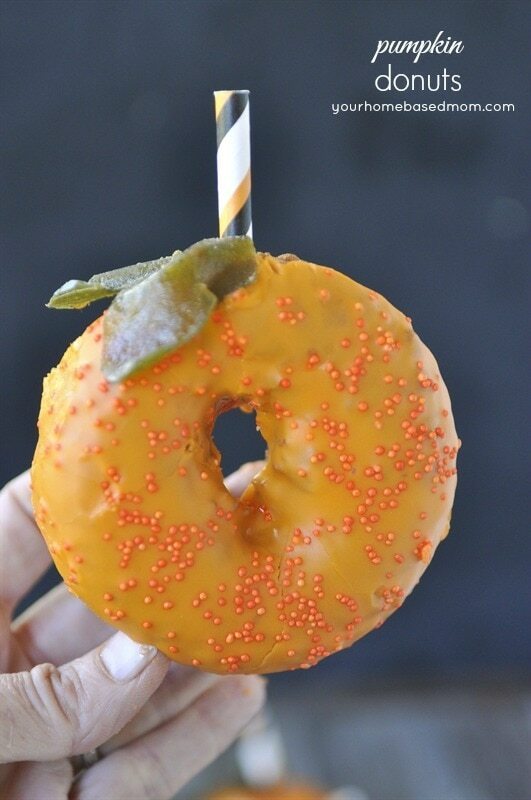 I think this is what we are going to do for my dd’s birthday which is the weekend after homecoming this year. FYI there are Coconut marshmallows available too now. I am going to try these too. You always have the best ideas! CUTE CUTE CUTE! 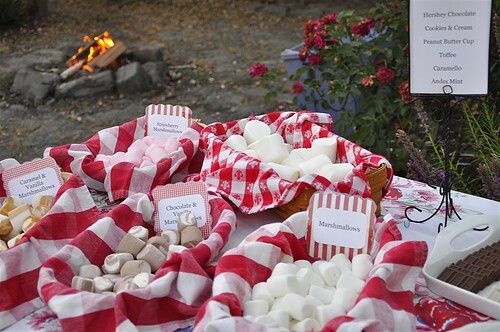 So adorable the way you set up that S’mores bar! I love the table cloth, I love the cloth napkins in the baskets of marshmallows! I have seen the choc. and the strawb. marshmallows before…but I have never seen the choc. vanilla swirl or the caramel and vanilla!! I would love to try those! My son likes S’mores with graham cracker, no cinnamon, cookies and creme choc. bar and strawberry marshmallow. Me, I’m a Reese’s girl all the way!! 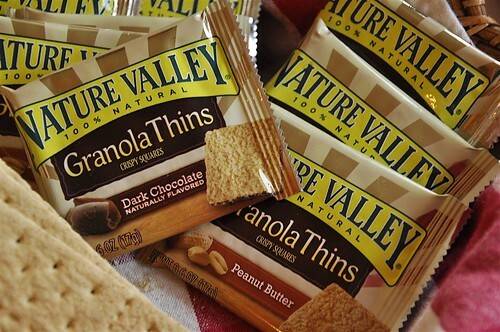 I love the idea of the Nature Valley granola thins!! Excellent! I love those things!! Excellent post! Leigh Ann, Your detail for parties truly inspires me. The smores bar is over the top! I have to borrow your idea for the month of October! One little problem though I can’t find any of those adorable menu holders you have. Any idea where I can get my hands on some? The little holders came from the Dollar Store and the big ones came from Goodwill! OH my GOSH! What a wonderful idea! My kids love s’mores – I’m thinking this is perfect birthday party stuff. What a fun idea! I will absolutely do this – thanks! i think chocolate graham crackers with marshmallows and strawberries sounds yummy. always like it with a reeses and sometimes we use fudge stripe cookies then the chocolate is on the cookie. you are such a fun mom! where will you put all this creative energy when your daughter is gone?! that’s where i am now, thank goodness for people having babies! What fun! I love the S’mores bar! You always come up with so many fun ideas and then you really do them! Love your blog everyday! What a great party! Thanks for sharing. Those Nature Valley Thins ARE to die for! I am hoping my family doesn’t discover them in our pantry! You have such style! Gorgeous photos. I made S’mores. Added your link to my post. How amazing. You are are incredible. Nice spread. I love this idea and want to plan something for my nieces just like this. Leigh Anne, you have such wonderful ideas!! My kids love building a fire in our yard and cooking out, but with our 100+ degree days this summer, it was entirely too hot. Now that we’re cooling down (only the mid-90s now! ), I was thinking we could host a fall party for my boys and our nephews. We usually let them cook hot dogs and s’mores over the fire, but how nice will a s’mores bar look?? 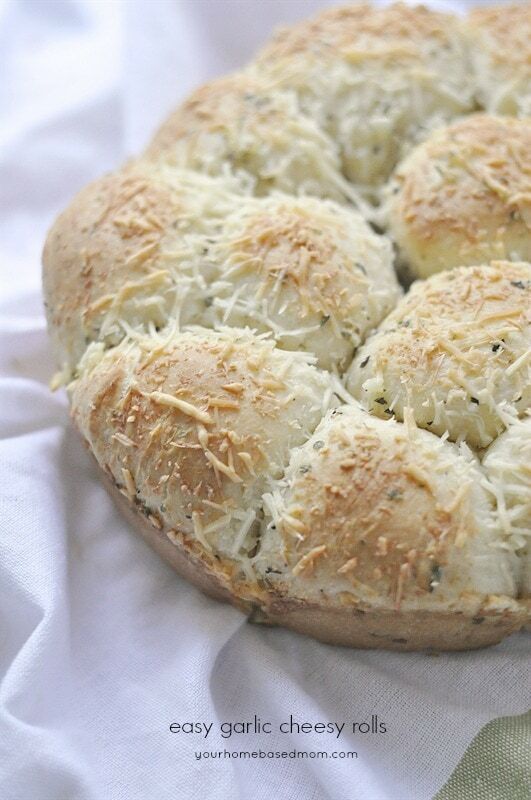 I bet I know 6 boys who will be very appreciative – and who will probably try every combination imaginable!! Thanks for the idea! This is a great party and I love s’mores. Would you mind if I reposted on my blog and credited and linked back to you? Thanks so much for letting me share this adorable party. The post is up today. What a fantastic idea. I’ve never thought to use so many different kinds of chocolate in s’mores. This looks like so much fun! FanTASTIC set-up!! 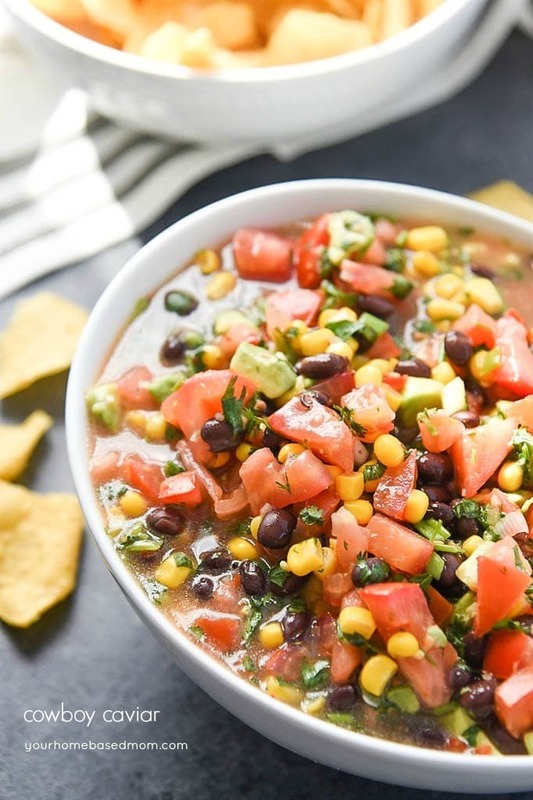 I’m including a pic and link-back in a post I’m doing on some Backyard Movie Night ideas. Amazing inspiration!! Thanks, I’m doing it for a winter outdoor wedding with cocoa, cider and soup. You are brilliant and have really saved me time and helped me by knowing it’s all at WINCO! Adorable menu holders also? Any hints, tips where you found those? I’m putting out nutella also for an international option. So glad you found the post helpful. Winco is the place! I found the menu holders at Goodwill Hope all goes well. What a fun idea – an outdoor wedding in winter.